Trica’s mission is to provide you with pieces that become the heart and soul of your home. Working with wood, metal and glass, this Canadian company strives to design high quality products that will be the perfect piece for your home. The ultimate simplicity of the Absolute line brings welcome peace into your bedroom – a room that deserves a minimalist approach to offer as much serenity as possible! 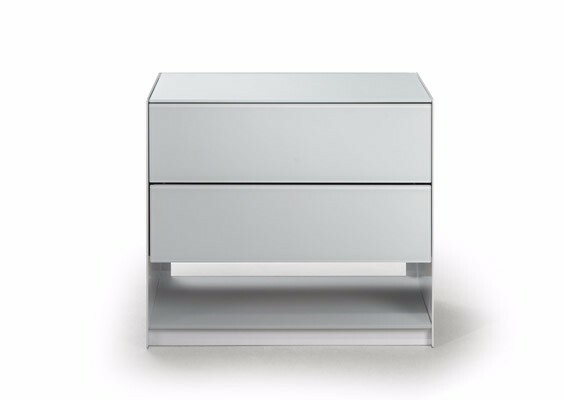 The Absolute bedroom collection includes a 1-drawer and 2-drawer nightstand, 3-drawer, 5-drawer, and 6-drawer chest. The frames are available in either brushed steel or a wide variety of powder coated metal finishes. There are several anti-glare, anti-fingerprint tempered glass finishes available. The interior of the drawers can be lined with Trica fabrics, vinyls, or bonded leather. The drawers operate on a push to open mechanism.